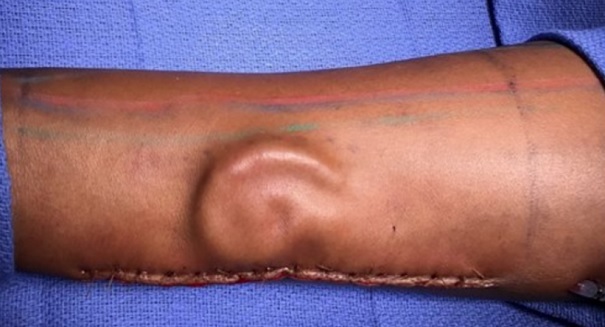 An Army surgeon has managed to grow a human ear on the arm of a soldier and then attach it to the person's head. US Army private Shamika Burrage lost her ear in a major car crash a couple years ago, but some incredible work by Army plastic surgeons means the 21-year-old will get her left ear back. And they were able to accomplish this by growing her new ear on her body, using cartilage from Burrage’s ribs to create the shape of the ear and then implanting it on her forearm. The skin was allowed to grow around this makeshift ear for a few months, allowing it to form new blood vessels and create some feeling in the air so that it would feel as close to a normal air when it was actually transplanted on her head. It took a few surgeries, but everything went according to plan, the US Army said on its blog. Burrage initially did not want the surgery and was going to opt for a prosthetic ear. However, she thought about it and decided that maybe it was worth a shot. Surgeons, meanwhile, believe that in five years people will not even notice that it is not her original ear. The surgery took place at William Beaumont Army Medical Center in El Paso, Texas. Pvt. Shamika Burrage, who hails from Mississippi, is a supply clerk with 1st Battalion, 35th Armored Regiment, 2nd Brigade Combat Team, 1st Armored Division. The accident happened in 2016 due to a tire blowout. The vehicle flipped several times and threw Burrage. Her cousin, who was eight months pregnant at the time, had only minor injuries, while Burrage suffered the devastating head injuries as well as compression fractures to her spine and road rash. “I was on the ground, I just looked up and (her cousin) was right there. Then I remember people walking up to us, asking if we were okay and then I blacked out,” said Burrage.